Need Help With Your Hail Damage Insurance Claim in Denver or Colorado Springs? It’s been a tough summer for Colorado homeowners and business owners. Hailstorms have caused millions of dollars of damage across Denver, Colorado Springs, Aurora and surrounding communities. Here’s the good news: most homes and businesses are protected by insurance. Your insurance will typically cover hail damage claims. Unfortunately, there’s some bad news too: the average hail damage insurance claim in Colorado is underpaid by 60% to 70%. That’s why many Denver-area residents are choosing a different approach: Denver home and business owners are hiring public insurance adjusters at record rates. • Prevent a denied or reduced claim and help ensure that you are paid what you are legally entitled to under your insurance policy. Public insurance adjusters are licensed professionals. These professionals often have decades of insurance industry experience. They use this experience to effectively manage your insurance claim for property damage to a home, business or commercial property. If you’ve experienced property damage at your Colorado home or business, then consider hiring a public adjuster through ClaimsMate Public Adjusters. We use our decades of experience to sift through public adjusters and screen them to find the Best of the Best. Hiring an adjuster is risk-free. Adjusters work on a contingency fee basis, which means you don’t pay your adjuster anything until you accept the final settlement offer from your insurance company. Public adjusters also offer free consultations. Schedule a free, no-obligations consultation with ClaimsMate today. A public adjuster will visit your home, scan your property for damages, then analyze your insurance policy to determine what’s covered. Our public adjusters are hail damage specialists with decades of experience helping Colorado home and business owners receive higher payouts! Most hail damage on a roof cannot be seen from the ground. Even when the hail is as large as one inch – like the hail seen in Denver and Colorado Springs this summer – roof damage will be completely invisible from the ground. This is a problem! Most homeowners and business owners don’t inspect their own roofs. You might have severe damage on your roof. Until you get up on your roof, however, this damage is invisible. 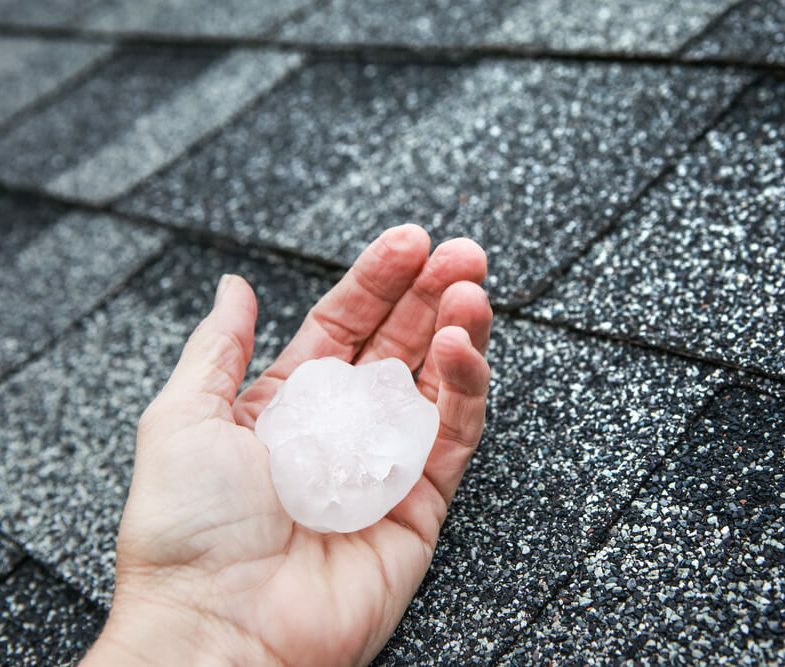 A ClaimsMate Public Adjuster will know exactly where to check for damages – including your roof and other spots where hail damage likes to hide. Remember: if you don’t report damage to your insurance company, then your insurance company won’t cover it. The longer you wait to file a claim, the more likely you are to encounter problems. Your insurance company may reduce or even deny your claim if you wait too long. Hire a ClaimsMate Public Adjuster today. The adjuster will visit your property to assess the damages. The adjuster can arrive at your Denver or Colorado Springs home or business as soon as this afternoon for a free consultation. Within minutes, hail can cause millions of dollars of damage across a city – and insurance companies have to pay for all of it. That’s why many insurance companies have developed a sneaky strategy. Insurance companies in America are notorious for underpaying hail damage insurance claims. In fact, the average hail damage insurance claim in Colorado is underpaid by 60% to 70%. This saves insurance companies millions of dollars every year but leaves homeowners with insufficient compensation. This practice is particularly prevalent in Colorado. Our state has the second most hail insurance claims in America, trailing only Texas. Summer hailstorms have become so frequent and costly, in fact, that insurance companies have been forced to raise premiums 54% over the last 6 years. Don’t fall victim to sneaky insurance companies. Hire a ClaimsMate Public Adjuster to increase your payout by up to 70%, or more. Colorado has experienced two devastating hailstorms this summer, including one in June and another on Monday, August 6. Your home or business might seem like it survived the storm – but your roof and other parts of your property could be severely damaged. A public adjuster will know exactly where to look to spot hail damage, then will manage your entire claim from beginning to end. If your home or business has been damaged by hail, then you need to make an insurance claim. For higher insurance payouts and a smooth claims process, hire a ClaimsMate Public Adjuster. Take a load off your shoulders. Get more money in your pocket. Protect your home or business. Prevent future damage. Schedule a free consultation with ClaimsMate today to begin your claim ASAP.